Leading Manufacturer of aluminium scaffolding ladder, aluminium scaffold tower ladders, aluminium tower scaffold, scaffold tower, aluminum scaffold tower and facade access system cantilever scaffold from Chennai. Backed by our in-depth industry expertise, we offer a wide range of Aluminium Scaffolding Ladder to our clients at industry leading prices. Our range provided in various specifications and meets the individual requirement of our clients. Fostered with vast industry experience and knowledge of this domain, we are engaged in presenting Aluminium Scaffold Tower Ladders. 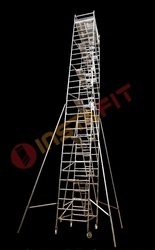 These ladders are largely used in industrial applications. Cleaning, repairing, replacing and maintenance of the mechanical parts installed at tall machines are made possible using such ladders. The offered ladders are attached with railing that allows the user to quickly climb up and down comfortably. Moreover, the spacious platform helps the user to stay stable and stand for longer duration. By using skills of our dexterous workforce, we are offering a comprehensive assortment of Aluminium Scaffold Platform. Besides being manufactured from high-grade raw material and latest technology, the provided product is inspected properly by our qualified expert professionals. 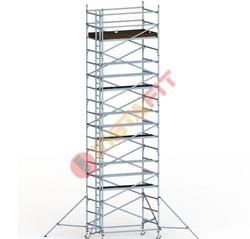 Owing to features like toughness, the provided scaffold is exceptionally valued by our precious clients. The provided product is available with us in a multitude of sizes and shapes at affordable price. 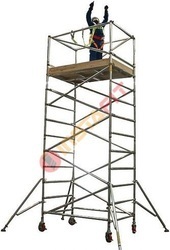 It allows for convenient working platforms that can reach many meters high. 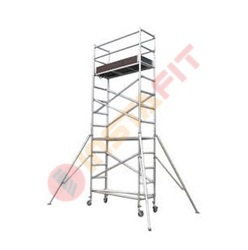 Scaffolding is necessary, because even if you were to use a tall ladder, a ladder will not provide the same level of stability. A ladder would not be very useful on a >forty-story high rise building! Only with scaffolding you can safely reach those heights. 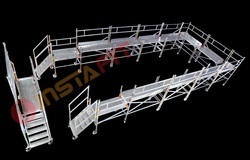 On scaffolding you will have a large platform for your construction/cleaning/decoration work space. The platform will need to be surrounded by guardrails for extra safety. We are Manufactured and fabricated in full compliance to the standards of the industry, the offered range of Aluminium Scaffold Tower has been widely appreciated for its features of durability and dimensional accuracy. The tower is extensively used in the industrial processes. Customers can avail this range from us in the most comprehensive and industry leading prices. By utilizing modern machines and latest technologies, we are also engaged in offering a quality range of Bridge Way Mobile Aluminum Scaffolding to our clients. These scaffolds are quality tested on different parameters and are authorized as per the industrial standards. Moreover, Bridge Way Mobile Scaffolds are corrosion resistant. 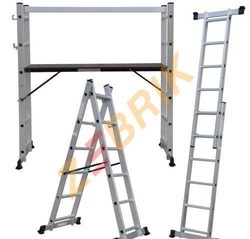 We are the manufacturers and suppliers of highly sophisticated Aluminium Folding Platform Ladder with Tools Tray which has been designed to cater to the multiple requirements with respect to its applications. The dimensional accuracy of this product is commendable which enables the user to achieve satisfaction of the highest levels. 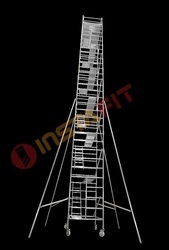 Our Aluminum Scaffolding Step Ladders have been designed keeping in mind the various applications it has been built. This product is highly durable and exhibits a great deal of accuracy in terms of its functionality. We have ensured that the price of this product is nominal and well within the reach of our clients which are widely appreciated. Height: Up to 60 ft. Looking for Aluminium Ladder & Scaffolding ?